04.22.2013 – Los Angeles, CA – American Illumination, Inc., a specialist in designing and creating one-of-a-kind LED light engines, has unveiled their LED GU24 direct replacement lamp. Part of the company’s new Verde Retrofit Series, this new model is one of the few GU24 direct replacement light bulbs available, and is the only one compatible with the GU24 locking ring for simple transitions from CFL to LED. American Illumination’s GU24 bulb will be displayed along with the rest of the Verde Retrofit Series bulbs at Lightfair International in Philadelphia, April 23-25, 2013 Booth 4148. The Verde GU24 bulb replaces the 13W CFL, consuming only 8.5W of total power and emitting over 700 lumens (warm white) for an 80+ lumens per watt efficacy. This replacement bulb provides considerable light output for residential and commercial applications, such as decorative pendants, chandeliers, vanity lights and various indoor fixtures such as ceiling fans and desk lamps. 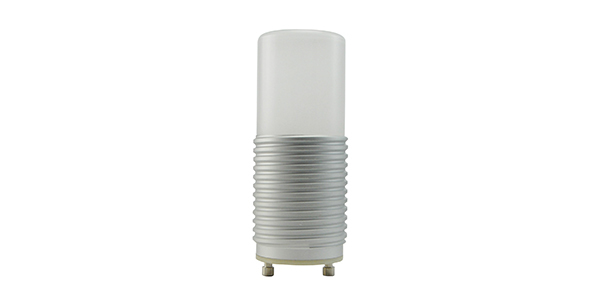 This new GU24 lamp contains Chip on Board (COB) LED technology, which means high heat conductivity and low thermal resistance for improved heat management. The aluminum housing is both attractive and functional, presenting a threaded body that is both compatible with standard GU24 locking rings and also acts as the bulb heat sink. The unique multi-directional diffuser emits a beam spread over 180° for generous, even illumination without visibly unattractive LED hot spots. The GU24 will be available to OEM’s, lighting designers and distributors through American Illumination’s sales channels. For additional information contact American Illumination at (310) 202-6500 or visit www.american-illumination.com . American Illumination, Inc.® specializes in designing and creating LED light engines for OEM fixture manufacturers and other lighting providers. The firm offers custom design solutions and helps companies streamline LED adoption while maintaining a high aesthetic and performance standard.